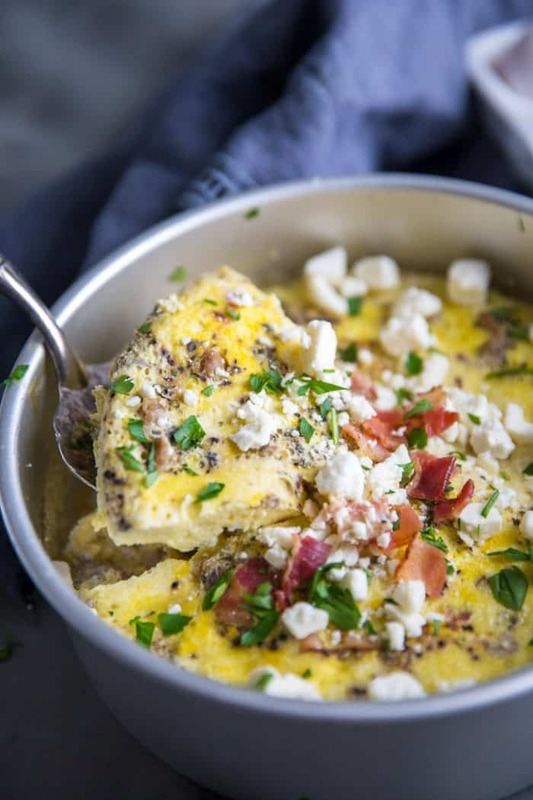 This breakfast egg casserole is so easy and so quick! It is fluffy and filling; great for any meal of the day! I’m proud to have partnered with the Ohio Poultry Association to bring you this recipe. What Is A Breakfast Egg Casserole? 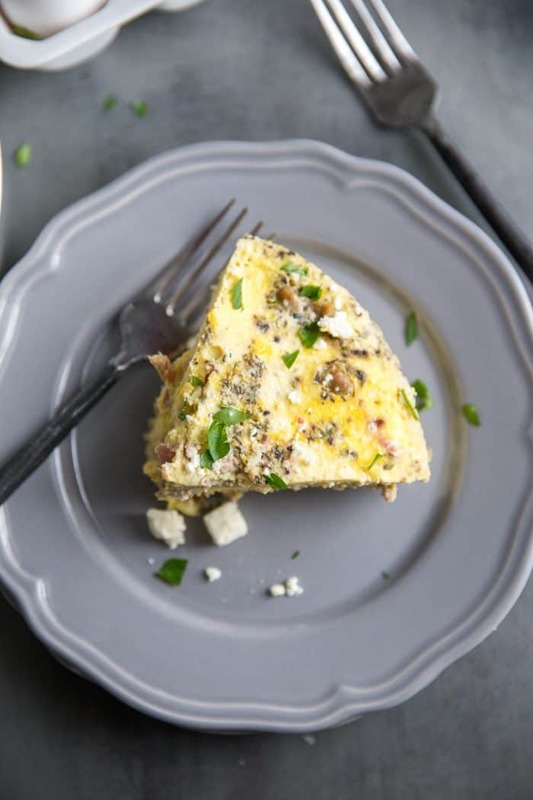 A breakfast egg casserole takes everything you love about an omelet and serves it up in a meal-sized portion. 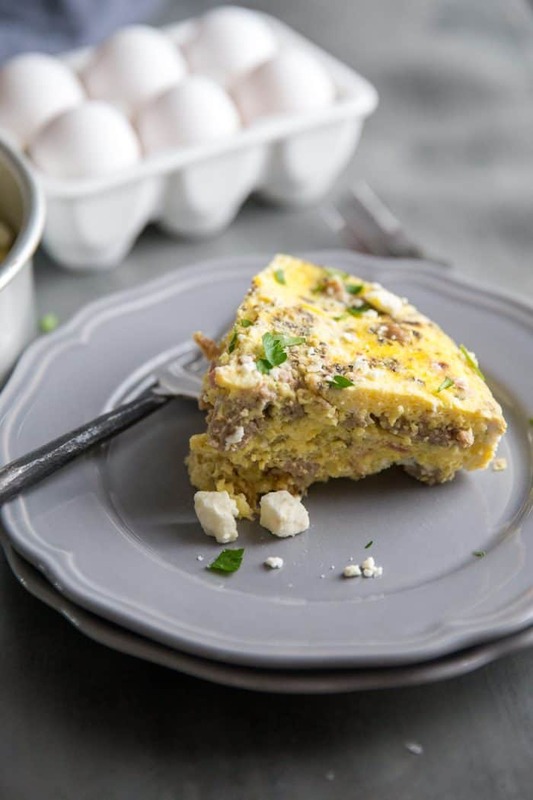 A breakfast egg casserole can be filled with almost anything! You can add almost any vegetable, bacon, sausage, ham (or all 3), potatoes and lots of cheese! Most breakfast egg casseroles are prepared in a large baking dish and baked in the oven. Using an Instant Pot reduces that cook time significantly! I used a 6 quart Instant Pot for this recipe. You will also need an 8-inch pan that can fit into the Instant Pot. A springform pan would be best. I do not own one that size so I used a tall, 8-inch cake pan instead. The presentation will be different if using the cake pan, but that is it. Be sure to generously spray your cake pan with non-stick spray. Using the saute setting, I crumbled and cooked some bacon, and turkey sausage. Once those are browned, remove the meat and set aside. Add the trivet to the bottom of the Instant Pot and add water. Place the meat on the bottom of your cake pan or springform pan (if you use a springform pan, cover the bottom with aluminum foil), top with shredded cheese. 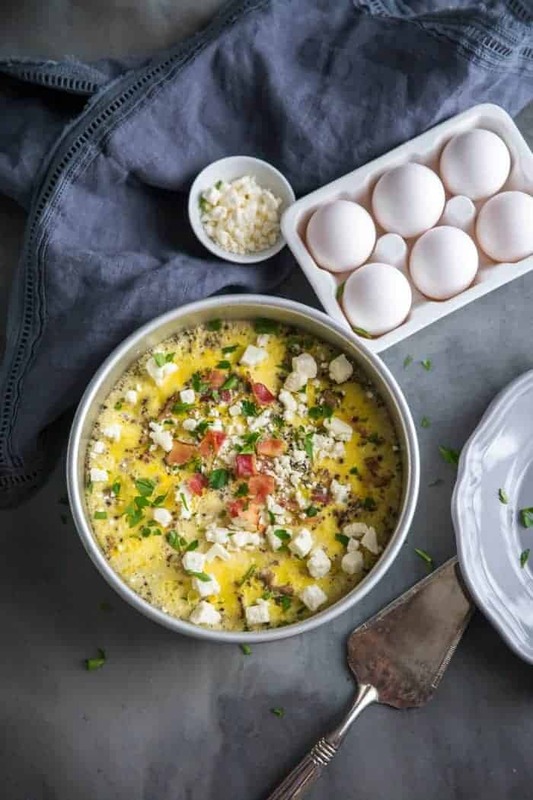 In a bowl, whisk together eggs, milk, salt, pepper, herbs, and garlic, The egg mixture gets poured over the meat and cheese. Place the pan inside the cooker, cover and cook on high for 12 minutes. Let the casserole sit for 10 minutes before removing from the slow cooker. 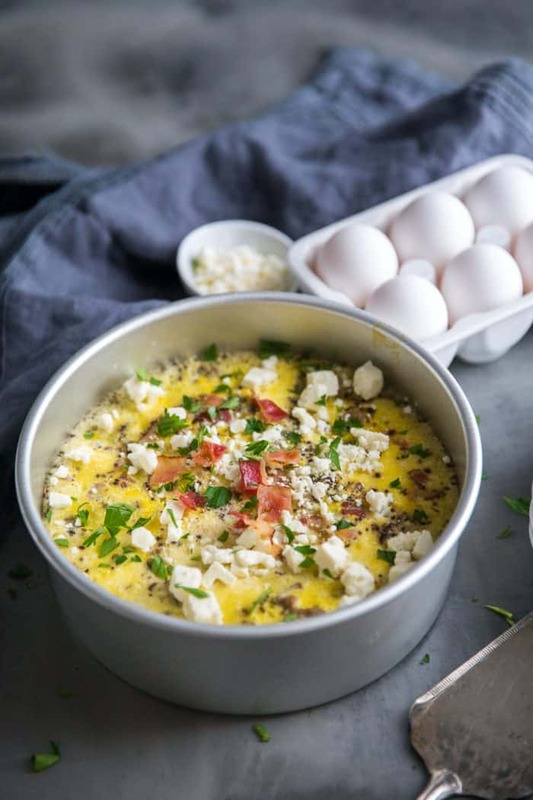 Sprinkle the egg casserole with crumbled feta once it is removed. Can This Breakfast Egg Casserole Be Reheated? Yes, it can! Allow the casserole to come to room temperature. Cover it loosely with foil and reheat it in the oven. This is a small casserole, so it should only take 15 minutes or so at 350 degrees. This egg casserole is a great way to start your holiday. Eggs are all-natural and contain high-quality protein to keep you fuller longer and energized all day long. One egg has 13 essential vitamins and minerals in varying amounts, high-quality protein, unsaturated fats and antioxidants, all for 70 calories! Round out your holiday breakfast with an Eggnog Dutchbaby, Hashbrown Casserole, and these Easy Savory Breakfast Biscuits! Visit OhioEggs.com to meet more egg farming families. Ohio egg farmers are proud to provide healthy, safe and affordable eggs to consumers all year, while protecting the environment for future generations. Visit www.OhioEggs.comand follow the Ohio Poultry Association on Facebook, Twitter, Pinterest, Instagram and YouTubefor more egg recipes and to learn about egg nutrition and egg safety tips. Set the instant pot to "saute". Add chopped bacon, and cook until browned. Remove bacon and set aside. Add the sausage to the hot pan. Crumble and cook until no longer pink. Add the onions and cook until onions have softened, about 4 minutes. Remove meat mixture and set aside, Add all but 1 tablespoon of the chopped bacon to the sausage mixture. Spray an 8-inch cake pan or springform pan with non-stick spray. If you using a springform pan, line the bottom with foil. 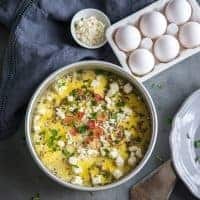 In a bowl, whisk together the eggs, milk, salt, garlic, basil, and oregano. Place the trivet inside the Instant Pot. Add 1 cup of water. Place the baking pan on the trivet. Place the lid on the pressure cooker and set it to 12 minutes on high. So fluffy and packed with goodness! I’m so making this for Christmas morning! Such a delicious egg casserole! Love all the add-ins! What a great idea! Makes breakfast so easy. Love that this frees up the oven! This was so good! Perfect for Christmas morning! I loved how tender the eggs were! So tasty. Such a great breakfast dish that we can enjoy throughout the year. Increase cooking time? I preface and set in the refrigerator overnight. Put in and set on high for 12 minutes. Pulled out when done and it was still runny. I’m so terribly sorry, did you allow it to see in the Instant Pot for 10 minutes after the 12 minute cook time was up?